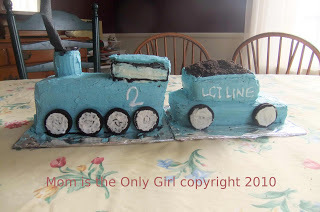 We had just family over for Sweet Pea’s 2nd birthday party, but received so many comments upon showing pics of the train cake that I had to blog about it as requested. Please enjoy this diversion from my regular style of blogging! So my little Sweet Pea turned two last month. Hubby and I love to make the kiddos’ birthday cakes something special that represents their main interest when their birthdays roll around. Sweet Pea’s first birthday was all about balls, with a ball cake and balls in a glass decanter as a centerpiece. It wasn’t a hard decision to make a train cake for Sweet Pea this year! I baked and had the idea, Hubby put it together! America’s Test Kitchen is a tried a true resource for us, and their basic yellow cake is so very delicious and easy that it’s my old standby. For this cake I actually made two batches of cake and baked them in a somewhat large bread pan (two batches filled 4 bread loaf pans half way each). Next time (if there is one!) I will definitely use a smaller size! Hubby stacked two cakes to make the engine. He then cut a third of another cake off and stacked that on top of the first two, with frosting in the middle as you would a traditional multi-layer cake. This became the cab of the engine. He then off-set the remainder of the third cake on top of the fourth cake to make the tender. Make sense so far? Using buttercream frosting we frosted everything, blue for the train, white areas for the side windows. A black tube of frosting was then used for the details, like around the windows and to outline where the coal would be on the tender. White frosting in a tube was used for the writing. We crushed chocolate sandwich cookies for coal on the tender, just laying it on so the frosting didn’t show, then used white frosting and frosted the center of 12 more cookies and gently stuck them to the side of the cake for wheels. We also used 4 more cookies, stacked with frosting in between, as a smokestack, and frosted that stack to match the engine. I suppose had we thought about it and had more time we could have used black licorice to make the wheels connect. 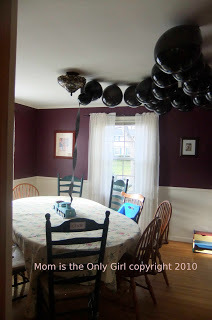 We had the center of a balloon weight, painted it black and set it on top of the sandwich cookies, taped black crepe paper to it and streamed that up to the ceiling. This became smoke from the engine. 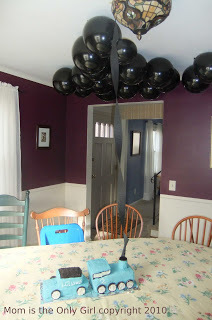 After blowing up 20 black balloons, and not fainting, I taped them to the ceiling to make the rest of the smoke from the smokestack! To round out the theme we pinned up a lot of train pictures, including one that looked as if it were running along a track (it was pinned up just above the chair rail in our dining area) which Sweet Pea absolutely loved! We also had a sign on the door that said “Sweet Pea Station” and I had printed out a sign “Platform 2” (but forgot to pin it up). The other rooms were decorated with red and black streamers. We had snow on the ground for his party, but I also saw the idea of making train tracks leading up to the door using duct tape or the like somewhere online. I hope you enjoyed this and hope that it may have inspired you to get creative with your birthday cakes! There are so many ideas online now for theme cakes for birthdays, it just takes a little bit of searching to find an easy one! Now, what shall we do for a dinosaur theme birthday party for Cutie Pie in a few weeks?! Love the smoke idea!! I made a little zoo train for monkey's 2nd birthday too – I can remember it so clearly because she sang along and clapped her hands…so cute! I hope sweet pea had a wonderful birthday too!! Will put my thinking cap on for cutie pie – I have two godsons so have been to lots of little boy birthday parties 🙂 Although I'm far better at fairy castles!